This tough question links to the NASA YouTube video NASA 60th: How It All Began which shows a lot of really nice, historical file footage and stills. 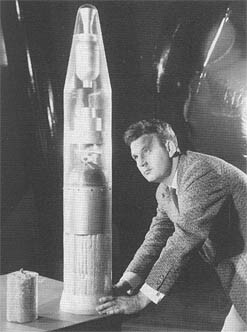 At about 01:56 there is a still of an engineer standing next to what looks like a sounding rocket, or a model of one, that is transparent. Behind the engineer is an inflatable, metallized balloon, smaller, but similar to the ones shown in the question Did Echo 2 remain spherical without requiring gas pressure? If so, how is this known to be true?, and it looks like an un-inflated balloon is stowed in a compartment of the transparent rocket as well. 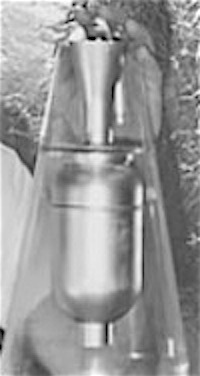 Most likely, the rocket is transparent because it is just a model, but I am still wondering what that thing is that looks like a nozzle, pointing up, in the cone. 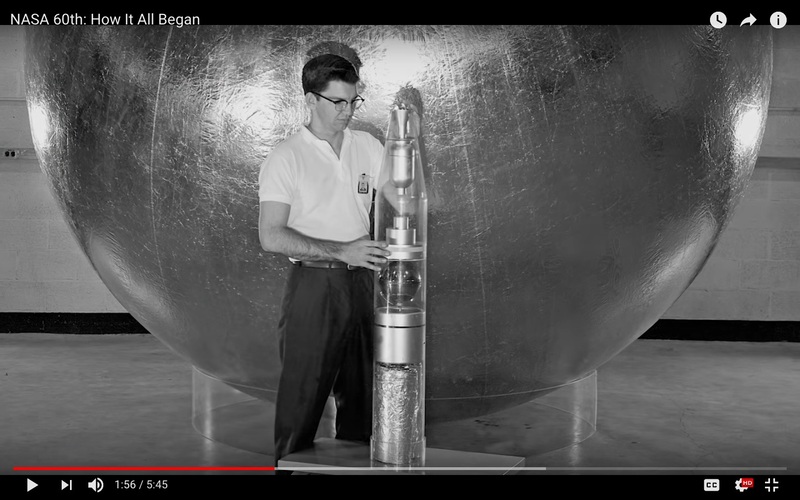 below: Screen shot from the NASA YouTube video NASA 60th: How It All Began. That is a model of a Vanguard nosecone / third stage with an "IGY magnetometer satellite" at the top. 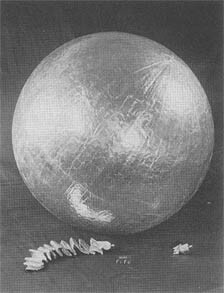 The sphere is the "Sub-Satellite", a precursor of Project Echo. Sad ending: It blew up in the launch attempt of the Vanguard SLV-5 vehicle. Another picture of the model is found in the same document (source linked below). The final, real-world payload may not have looked like this model. It may have looked more like Vanguard 3 shown in the answer to this question: This BBC photo does not show a replica of Vanguard-1, what might it be? Not the answer you're looking for? Browse other questions tagged identify-this-object balloons sounding-rocket or ask your own question. Did Echo 2 remain spherical without requiring gas pressure? If so, how is this known to be true? What is the Fischer 1960 Mercury Ellipsoid, and why is it called that? Identify this rocket and launch site from Gilligan's Island episode? What is the “baby rocket” attached to the booster on this rocket?